24th and 25th April 2008 were the key dates for us to remember. 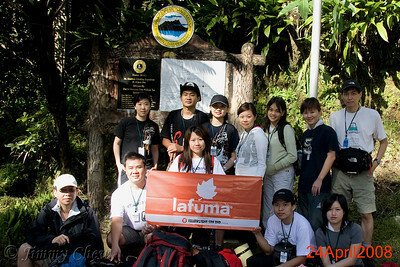 Twelve of us embarked on a journey to climb the highest peak in Malaysia. 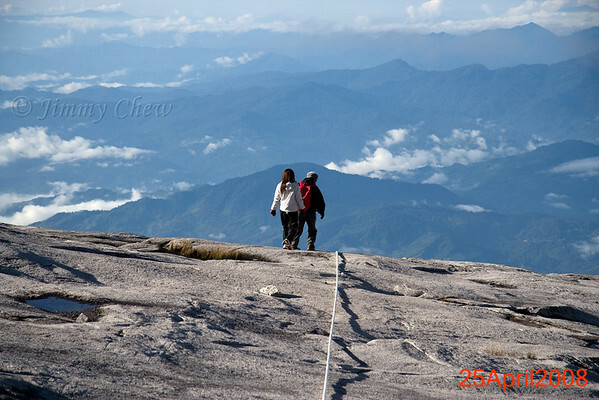 Yes, Mount Kinabalu. 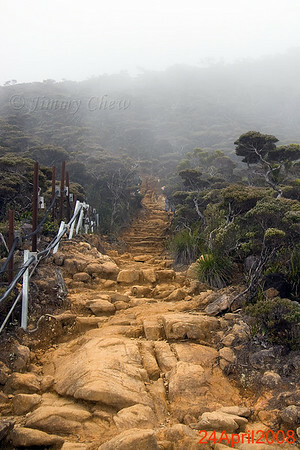 We chose the Mesilau Summit Trail for the climb. 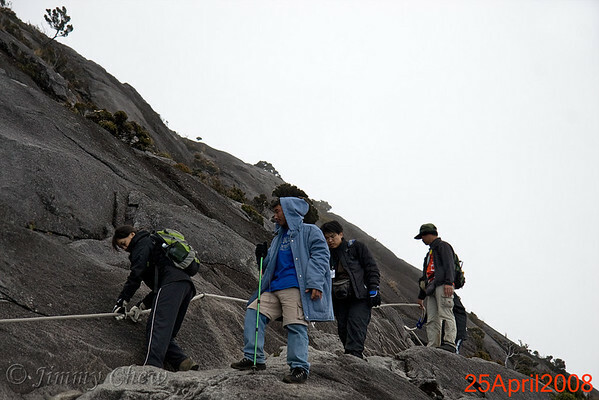 Whilst a few of us in the group climbed Mount Kinabalu before, none of us experienced the Mesilau trail. Why Mesilau trail, as one of the members from another group asked? 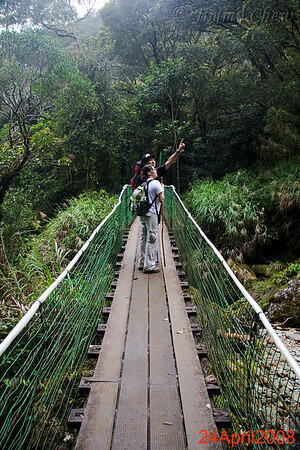 Dogbert responded, “insanity!” Mesilau trail involves trekking Mesilau Nature Park on the Mesilau plateau. 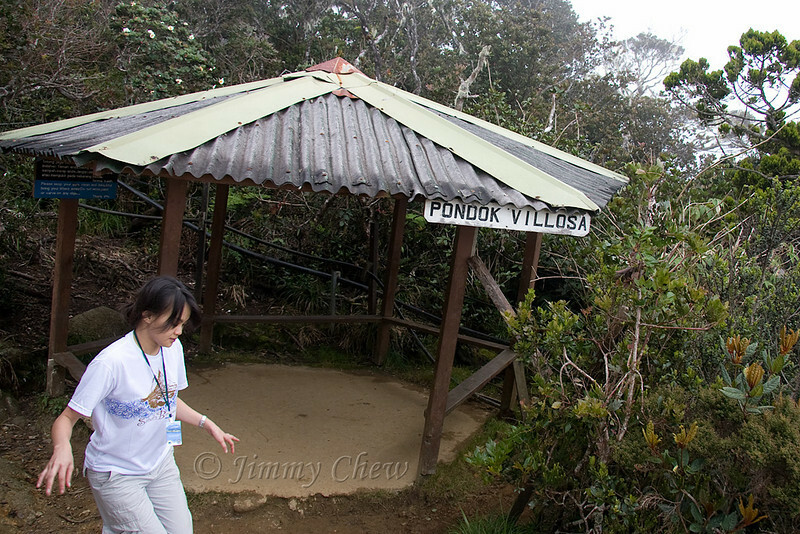 It is about 2 km longer than Timpohon trail, but has more flora views to offer, than Timpohon’s “endless” uneven steps. 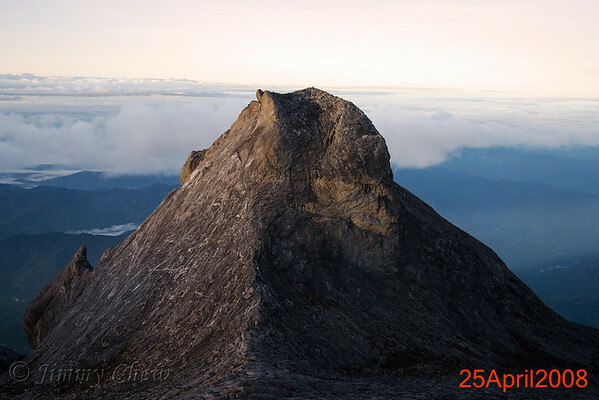 By the way, in case anyone thinks Mount Kinabalu is the tallest mountain in South East Asia, that is no longer the case. Wikipedia has more. It is fourth tallest; and in top 20 in the Prominence list. 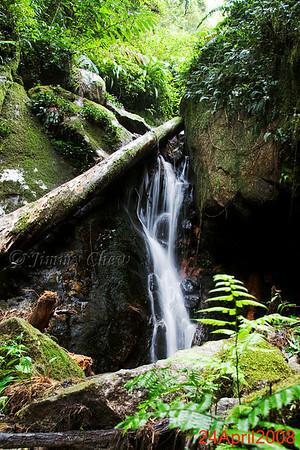 There are a number of small waterfalls and streams along the trail. This particular fall allows one to go near it for photography, and rest. 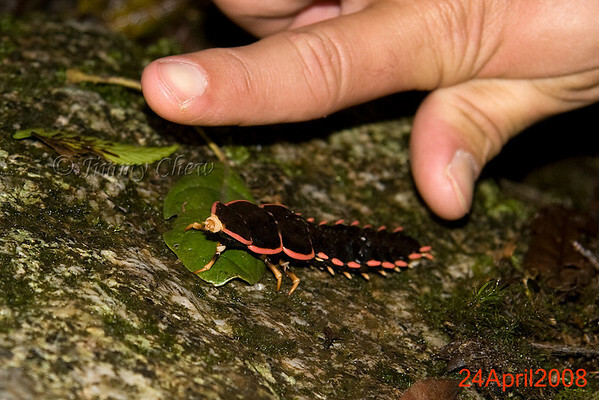 This was one of the more interesting insects we stumbled upon, although we do not have a clue about its name. KT offered his finger for scale. Parts of Mesilau park are quite densed as there are parts of open spaces where one can view the mount and the valleys and villages beneath. Mesilau vs Timpohon: For those who aim for more challenge, more diverse nature and breathtaking views, this is the trail for them; and Timpohon trail is for those whose objective is to reach the peak with the least distance traveled. 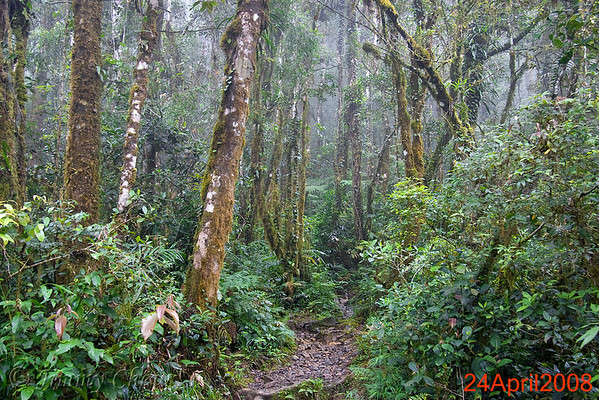 This trail is new, suggesting less crowd, and not many are aware of this beautiful trek—the serial number appearing on the certificate (“via Mesilau Summit Trail”) is still 5 digits (4xxxx) whereas the Low’s Peak certificate is bearing 6 digits (16xxxx)—one can more or less gauge the number of visitors climbing the two trails. Oh yes, you get two coloured certificates by using this trail up. In my short opinion, Timpohon trail is plain boring. I’m sure those who have tried both trails will agree with me. Photographers will definitely appreciate its assorted perspectives. Obvious tip: If you are using this trail, a camera is a “must have”. 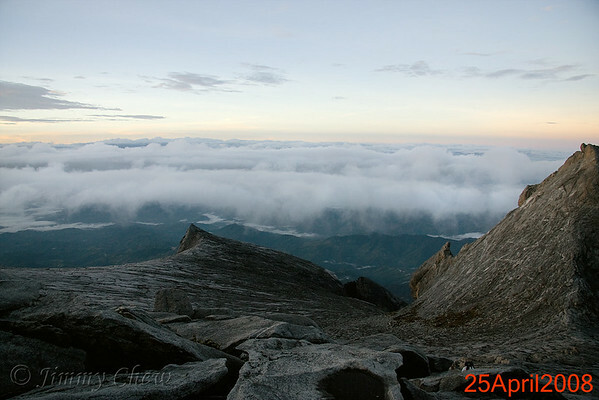 The terrain after Layang Layang will continue for a certain distance before reaching Laban Rata resthouse. Water and electricity travel on the rails alongside the climbers. This section of the trail is after the intersection of Mesilau and Timpohon trails. More traffic can be expected from here on. Nice place for photography, by the way. Me and Dogbert came down from Laban Rata room at 1:30 in the morning to capture the mountain ridge, with Donkey’s Ears Peak at far right. 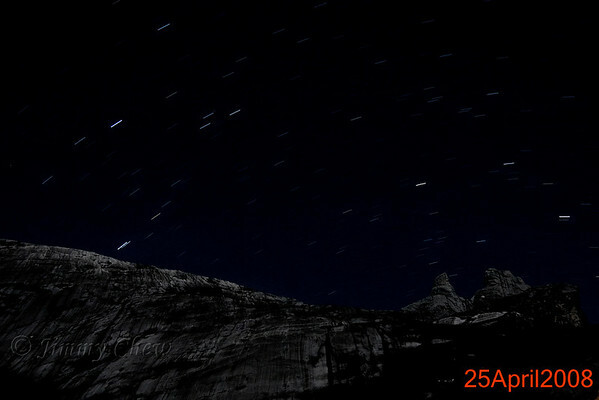 Aimed with the tripod, I did a long exposure shot of the huge granite rock. Moonlight provided some light reflection; along with star streaks. We were lucky to be presented with this photography opportunity—the view of the clear, night sky was just awesome. We spent about 15 minutes all in all. 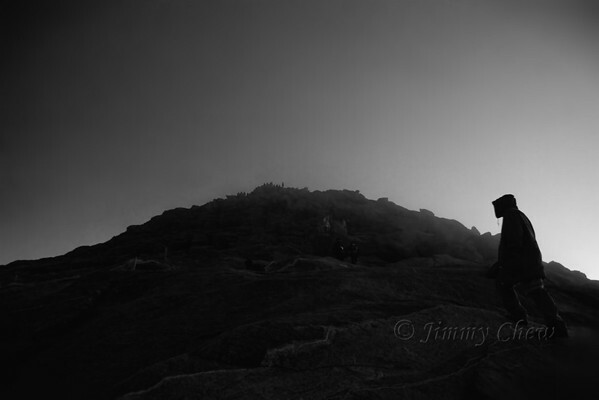 Later, our group began the night climb (Day 2 as commonly known) at 2:30 am after a short briefing by our guide. 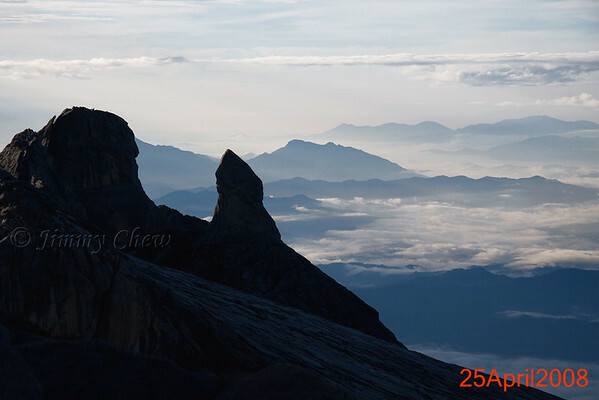 Tip: Start your climb at 2:00 am, if possible, so that you can catch the sunrise at Low’s Peak. And climb slow, you don’t want to catch altitude sickness. 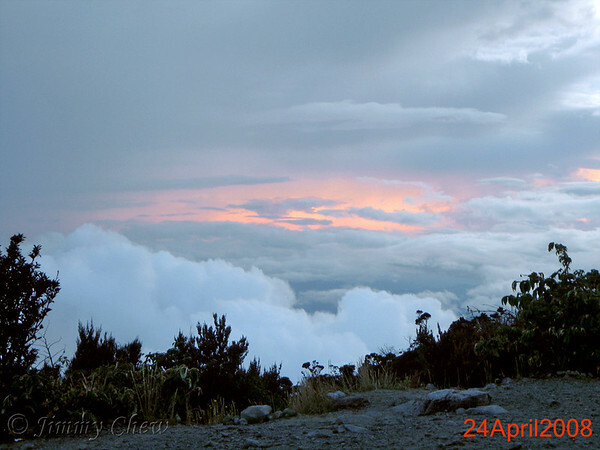 Another tip: Sleep early the night before to allow your body to acclimatise to high altitude. 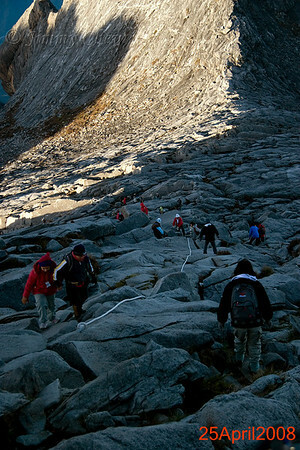 Scores of climbers on the way to Low's Peak. A remarkable sight of determination and perseverance. Sunrise on the right produced this silhouette that reminds one of "I Know What You Did Last Summer". Or "Urban Legends". All twelve of us, Cybersquad, made it to the top. Clockwise from leftmost: Tze Min, me, KT, Brian, Dogbert, Edna (organiser), Chang Chern, Lee Hsia, Lee Phin, Yen Ling, Cherie and Margaret. 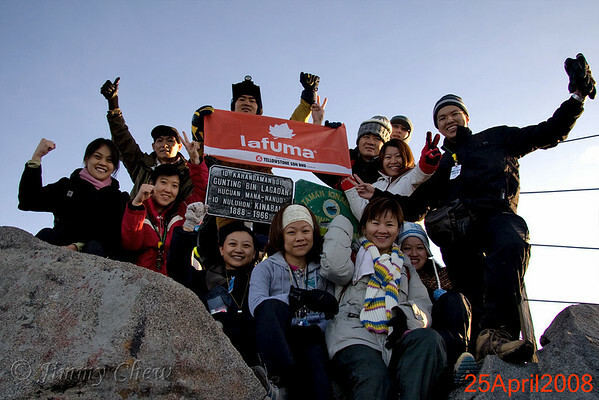 We hanged out around the peak for some (not overly long) time for sufficient photography, just as the rest who made it to the top. As the area is small, it was completely populated in no time, and we couldn’t (and shouldn’t) stay long, as those waiting below and along the way were waiting for the opportunity to be there too! It seems the two signs erected right at the top are vital evidences of achievement. I believe that is true! The wired railings on the right is to deter further advances to the right, a fall that will land one into Low’s Gully. We finally held up the Lafuma banner once again. “Heavy” traffic was seen both ways. 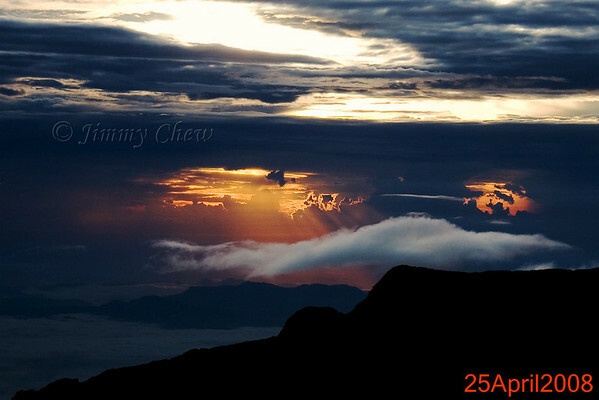 Watching sunrise right from Low’s Peak may not be everyone’s ultimate wish so long they reach there. Many appeared to be rushing back down to the huts to pack stuff and leave. This is no surprise, as all needs to reach Timpohon (or Mesilau) gates before night falls. As Edna and Brian were heading off towards the horizon, this spectacular view, with ranges of mountains far away, leads one to think of the great depths just beyond the “edge” of the plateau. Descending can be quicker but one still needs to exercise care. Our guide Wilbert doesn’t need the rope to traverse the steep, treacherous slopes. He was holding on to my trekking pole so that I could use the rope. We see Tze Min and Chang Chern’s turn to use the rope. 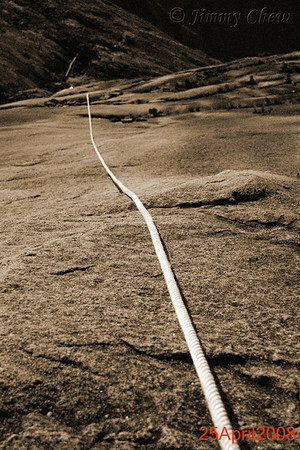 One can easily forgot he/she had once held on tight on this rope during the night climb. The only difference is it felt safer during the ascend as no dangerous surrounding was visible in the dark! Here I was taking a breather to enjoy the vast scenery from the mount. I was sporting a smooth Lafuma socks with another sports socks as second layer, not because of cold but to fill that little gap in my trekking shoes. After checking out from Laban Rata resthouse, we headed back down on Timpohon trail, braving the rainy weather throught the entire journey. The trekking pole / walking stick was extremely useful during this time. This photo was taken along the way down to Timpohon gate. 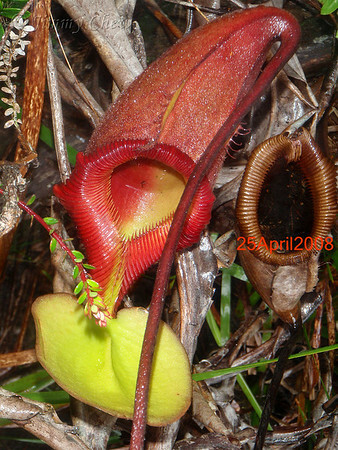 As one of the most beautiful flora items, this pitcher plant was photographed by our guide, Jemin, from deep inside the woods. The plant is not visible from the main trail. He borrowed my Olympus mju 1030SW and whistled all the way, until complete silence, into the woods to shoot this. It was more than drizzle at that time, and I continued my journey, with a pair of injured knees. Earlier, he dropped the Olympus camera into a deep mud when I was passing it to him to remove a speck of dirt from the lens cover, since I was wearing gloves and was not able to do it myself. He apologised profusely so much so I couldn’t interrupt to explain the features of the point and shoot camera, that it is capable of underwater shooting, drop and crush resistance and etc. I poured water to wash off the mud from it. After all that elaboration, he uttered a short, “oooh!” It was a hilarious moment. Unfortunately during this time, no Rafflesia was available. The last hour was raining cats and dogs and night came much earlier at six plus until few of us had to turn on our headlamp before finally step past Timpohon Gate. 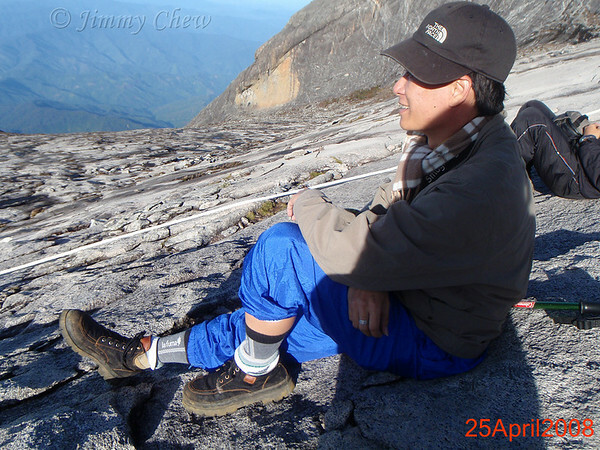 My suffering knees initially gave me the feeling of one way ticket to the top. Lone travel, coupled with cold temperature (which I liked) and rain, gave me the motivation and challenge to finish what I started - I believe. Side note: I was asked if the climb was "hell?" I jokingly replied, "I went through hell to get to the heavens." Truly speaking, it wasn't at all, provided one has done sufficient training, or has the benefit of youth. Thx to Edna, our organiser for this trip! And to all for making the journey a fun and laughable one! For selective viewing, click on the links below. Once the blog read is done, you may away the long blog above "« Click to hide/show blog & description »" to enjoy viewing the photo gallery. More pictures with Chang Chern and Cherie. Tze Min passing by Pondok Villosa.